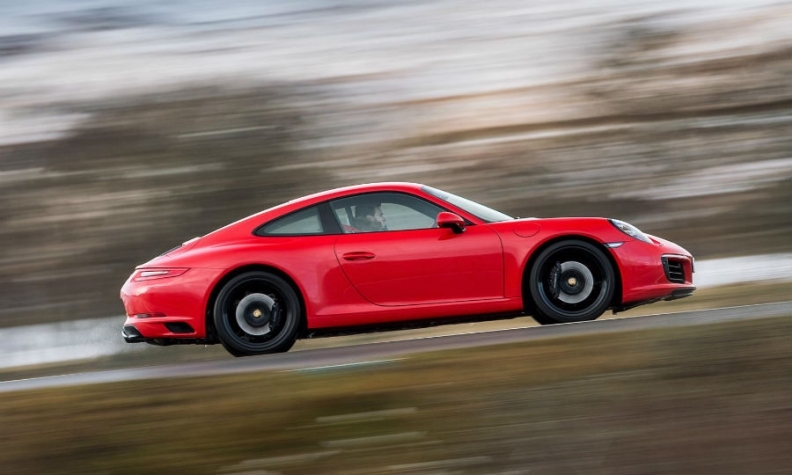 The 911 will get plug-in hybrid but will never be fully electrified. STUTTGART -- Porsche says full-electric and hybrid-electric cars will account for 25 percent of sales by 2025 but there will not be a battery-powered version of its iconic 911 sports car. The 911 will get a high-performance plug-in hybrid version but it will never be fully electrified, CEO Oliver Blume told reporters at the automaker’s annual results conference here earlier this month. The plug-in hybrid will not be available when the latest-generation 911, code-named 992, launches this year even though it was developed to allow space for a high-voltage battery, Blume said. "We are waiting for the further evolution in battery technology so you should not expect a plug-in version in the coming years. It’s currently planned when the 992 is refreshed,” he said. Porsche's first full-electric car, the Mission E sedan, will launch next year. The automaker gave a new performance detail, saying its 800-volt electrical architecture, originally a development for its Le Mans race car 919 Hybrid, will give drivers a 100-km (62-mile) range after just four minutes of battery recharging. Porsche confirmed will build more variants of its Mission E, including one based on the Mission E Cross Turismo unveiled at the Geneva auto show, which is expected in 2021. Porsche also plans to build a network of 400 fast-charging stations in Europe by 2020, as well as offer customers home-charging solutions. It will also develop cordless charging stations that use electromagnetic induction. Audi revealed last week plans to build a third electric vehicle after on Porsche’s Mission E platform, which is called the J1. Initially the fastback, to be called e-tron GT, was to be built on Audi’s own EV architecture, but sources at the company said the higher battery floor needed for an SUV body style wasn’t ideal for a sedan. Porsche and Audi are working together on a new EV architecture, dubbed PPE (Premium Platform Electric). So far no cars have been announced yet but Blume said its Leipzig, Germany, plant has a good chance of being equipped to build PPE models, suggesting a PPE-based Macan was a possibility. Long term, parent Volkswagen Group has assigned Porsche the task of developing its third purpose-built electric-vehicle architecture for sports cars and supercars called SPE that may also be used by Audi and Lamborghini that will be developed solely by Porsche. Porsche is still hesitating over whether to resume offering diesel models. Blume said he wanted to wait and see how customers cope with the current lack of a diesel in their range. Diesels only account for 12 percent of Porsche sales, Blume said. He hopes that Porsche can tempt its customers to opt for a plug-in hybrid. About 60 percent of all Panamera four-door fastbacks ordered by customers in the EU are plug-in hybrids. Blume said Porsche will contribute to offer only gasoline-electric hybrid cars. “Diesel plays a subordinate role at Porsche, and when we launch a plug-in hybrid it will always be in combination with a gasoline engine,” he said. Blume said the company was not considering starting production in the U.S. despite President Donald Trump's tariff threats. He also said there was no truth to reports that Porsche was in talks to build cars in China with parent Volkswagen Group’s local JV partner SAIC. "Engineered and Made in Germany remains an important seal of approval for our customers,” he said. Porsche's global deliveries rose by 4 percent to a record 246,000 last year. Operating profit increased 7 percent to 4.1 billion euros with its operating margin rising to 17.6 percent from 17.4 percent the year before. Rapid volume growth in recent years has been largely driven by adding the compact Macan in the popular SUV segment.